… the act of preserving, guarding or protecting to keep healthy, preservation. 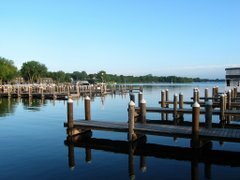 According to the Lake Minnetonka Conservation District’s 1991 management plan, “The first major focus of the LMCD was on environmental problems, reflecting deteriorating water quality…” At the time of the LMCD’s formation (1967), Lake Minnetonka water quality was foul – the lake had legendary algae blooms and stank. Fortunately, the main causes – sewage discharges to the lake – have been eliminated and lake quality today is markedly improved. Indeed, most of the lake has “A” or “B” grades. Some of the shallow western bays with poorer quality will no longer improve due to nutrients trapped in the lake bottom. Today, the most significant conservation need for Lake Minnetonka is the control and prevention of exotic species. We know that milfoil control is now possible and zebra mussel, if it gets to the lake, would be a disaster. Today, milfoil control in Lake Minnetonka is not occurring. The LMCD’s harvesting program, which does a good job of providing recreational access in some areas, is not a control program in the sense of the management plan’s objectives. The 2006 milfoil demonstration project showed that bay-wide milfoil control is possible. And preventing the spread from Lake Minnetonka, the state’s job, has never been seriously attempted. In fact, the rate of spread from Lake Minnetonka to other Minnesota lakes, about 10 new lakes per year, is about five times greater than Wisconsin’s rate in their first 20 years with milfoil. As far as prevention of new species, the access inspection program and video surveillance system is a good start. The Lake Minnetonka Association recognizes the LMCD has stretched its resources to provide this. Unfortunately, much more is needed and our lake remains highly vulnerable. Again, the 1991 management plan recognized the LMCD’s funding limitations and recommended user fees to provide the additional funding: “User fees will be used to the maximum possible extent.” In fact, the plan called for boat stickers or permits and a permit fee at boat ramps. The Lake Minnetonka Association has advocated for milfoil control and zebra mussel prevention. We now know that bay-wide, perhaps even lake-wide milfoil control is possible. I am happy to report the Lake Minnetonka Association and the LMCD have agreed to prepare a lake vegetation management plan as the first step to more comprehensive milfoil control. We also know that comprehensive protection must occur. We are ready to confront these conservation challenges, but we need our agencies and cities to step up. So what next? Right now, we challenge the LMCD and the 14 member cities to include these conservation priorities in their 2008 budget, which as drafted contains no increases for milfoil control or zebra mussel prevention. There has been debate about budget priorities among the LMCD board members and the cities they represent. And there appears to be some immediate shifts that can occur within a reasonable overall budget increase. Specifically, a) there is no need to add a ½-time staff position for code enforcement, b) funds could be shifted from the budget reserve and c) the accumulated funds for the state’s boat user surveys should be used, as this data is not used by the LMCD. The LMCD also has about a quarter of a million dollar fund balance in their “Save-the-Lake” fund – a fund dedicated to lake conservation. Finally, user fees must be considered as a supplemental funding source to fund milfoil control and comprehensive protection. The Lake Minnetonka Association also recommends the 1991 management plan be revisited. The plan, now out of date, called for the LMCD to be the lead agency and advocate for implementing the plan and assuring the plan’s objectives were met. Until the management plan is revised, the need for controlling and preventing exotic species is urgent. We must all be dedicated to the conservation of our beautiful lake.